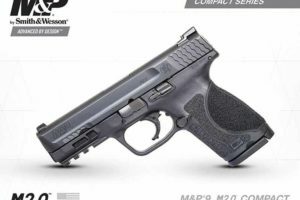 About 40 minutes ago, Smith & Wesson tweeted that they are introducing a new M&P M2.0 Compact with a shorter 3.6″ barrel, available in both 9mm and .40 S&W. Length: The M2.0 Compact 3.6″ is 6.8” vs 7.3” for the M2.0 Compact 4″, making it a full 1/2″ shorter in overall length. Height: Both pistols have a height of 5”. Weight: The M2.0 Compact 3.6″ weighs 25.9 oz. vs 27.0 oz. for the M2.0 Compact 4″. Barrel: The M2.0 Compact 3.6″ has a barrel length of 3.6″ vs. 4″ for the M2.0 Compact 4″. Capacity: The M2.0 Compact 3.6″ and 4″ have the same standard magazine capacity of 15 rounds (9mm) and 13 rounds (.40 S&W). Length: The M2.0 Compact 3.6″ is 6.8” vs 6.7” for the original Compact. Height: The M2.0 Compact 3.6″ is 5″ vs. 4.3″ for the original Compact when using the flat bottom magazine of the original Compact. 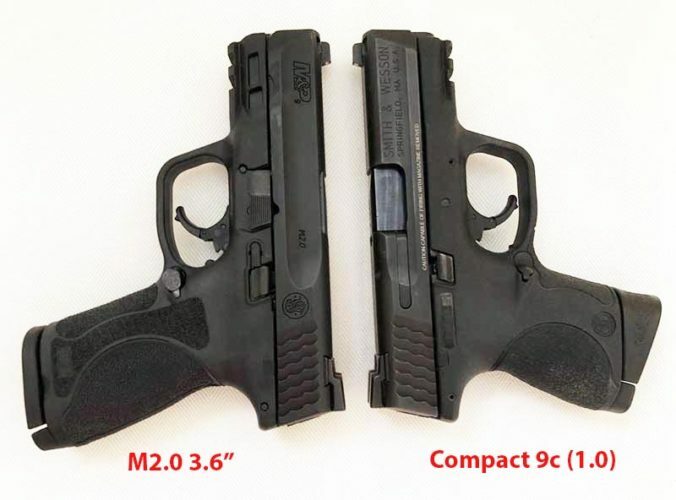 However, if you use the original Compact’s magazine with the grip extension, the height of the original Compact becomes approximately the same (5.0″) as that of the Compact 2.0 when measured from the front bottom edge of the original Compact’s grip extension. See image below. Weight: The M2.0 Compact 3.6″ weighs 25.9 oz. vs 24.7 oz. for the original Compact. Barrel: The M2.0 Compact 3.6″ has a barrel length of 3.6″ vs. 3.5″ for the original Compact. Capacity: The M2.0 Compact 3.6″ has a standard magazine capacity (in 9mm) of 15 rounds vs 12 rounds for the original Compact and in .40 S&W, 13 rounds vs. 10 rounds for the original Compact. 2 extended sleeves for 17 round (9mm) or 15 round (.40 S&W) magazines. Smith & Wesson’s M&P Compact M2.0 3.6″ strikes an excellent balance between concealability and capacity. Reliability. The Compact M2.0 3.6” is extremely reliable. After shooting 125 rounds of Hornady Critical Defense 115 grain 9mm Flex Tip JHP ammo along with 100 rounds of Magtech 115 grain 9mm FMJ ammo and 300 rounds of Blazer Brass 115 grain 9mm FMJ ammo, I experienced no failures whatsoever. Trigger. Like the rest of the 2.0 line, the reset is audible and tactile. It also has the same lighter trigger pull (when compared to the older 1.0 models) which I really like a lot. Grip Texture. I admit that I am not a fan of the new aggressive stippling, so I ordered a rubber Talon Grip and sanded down the backstap. Accuracy. Not surprising, I find the 2.0 to be very accurate. Recoil. As you might expect, recoil is moderate. 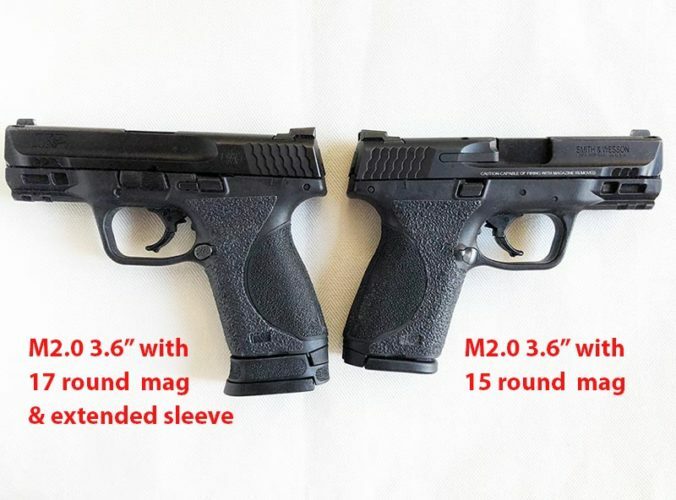 Will the M&P Compact M2.0 3.6″ fit in Holsters made for the 1st-gen M&Pc? That depends on the holster. 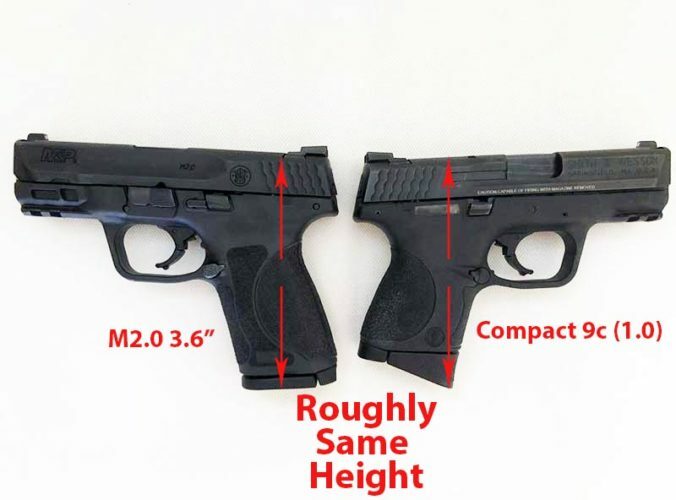 The M&P Compact 3.6″ will not fit correctly in my L.A.G. Tactical (The Defender) Kydex IWB/OWB and my Concealment Express Kydex IWB holsters made for the 1st gen M&P 9c. However, the M&P Compact 3.6″ seems to fit fine in my Galco TR 474 Kydex IWB holster which was made for the 1st gen M&P 9c. 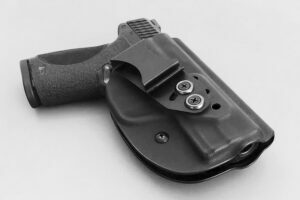 There are a growing number of Kydex holsters made specifically for the M&P Compact M2.0 3.6″. A few of them are listed below. 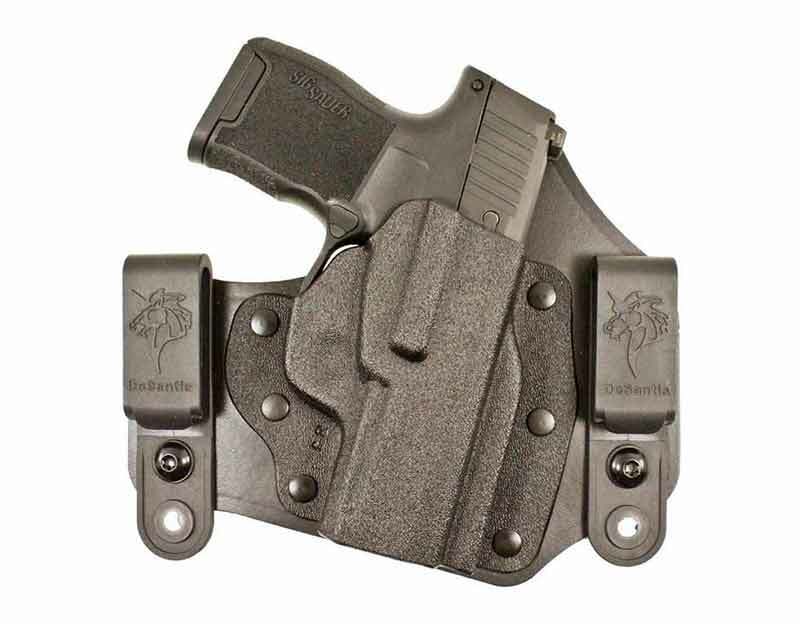 Vedder also makes Kydex OWB holsters, pocket holsters, mag holsters, hybrid holsters and even gun belts. 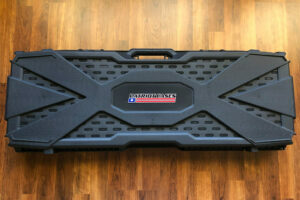 Speaking of gun belts, check out the Blade-Tech Ultimate Carry Belt review here. I just recently purchased this outstanding gun belt which sells for a very reasonable price. I’m a little shorter than average and I have no problem comfortably concealing the M2.0 3.6″ inside the waistband, even in the Summer when wearing only a loose T-shirt and shorts. So, it should be no surprise that the M2.0 3.6″ is my favorite EDC gun. The M&P Compact M2.0 3.6” is truly a remarkable compact-sized pistol that can be used equally well for both concealed carry and home defense. Smith & Wesson’s M&P Compact M2.0 3.6” strikes an excellent balance between concealability and capacity. Moreover, the shorter 3.6″ barrel (1/2″ less in overall length than that of the 4″ barrel Compact M2.0 and the Glock 19) along with the 15+1 (9mm) capacity (or 13+1 in .40 S&W), 18-degree grip angle, crisp lighter trigger and the low-bore axis all make for a well-balanced, natural and comfortable gun to shoot. It also feels more substantial in your hands, especially when compared to the smaller sub compacts and pocket pistols which can be a little snappy due to their lighter weight/diminutive size. 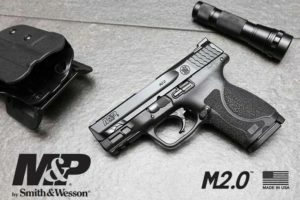 Although I initially would have preferred that this new 3.6″ Compact have a shorter grip (like the original 1.0 Compact) to accommodate a 12 round magazine (with a mag extension sleeve for a 15 round mag), I ended up really liking the new M&P M2.0 3.6″ Compact. In fact, I like this gun so much, I recently purchased another one (see photo below). I recommend that anyone interested in the M&P M2.0 3.6″ Compact go to their local gun store and check it out. Suggested retail pricing is $569 but you should be able to purchase it for less at your local gun store. Here are a few photos of my new M&P Compact M2.0 3.6”, my original M&P Compact 9C and my M&P Full Size M2.0 with 4.25″ barrel (with a Talon Grip). 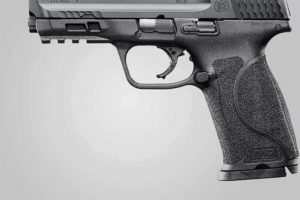 Previous ArticleSMITH & WESSON SUMMER REBATE 6/29/18 – 9/2/18Next ArticleSig P365. 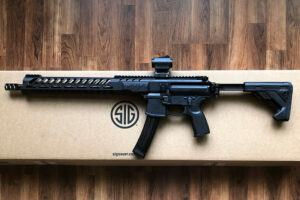 A Great Gun…Just Not For Me. 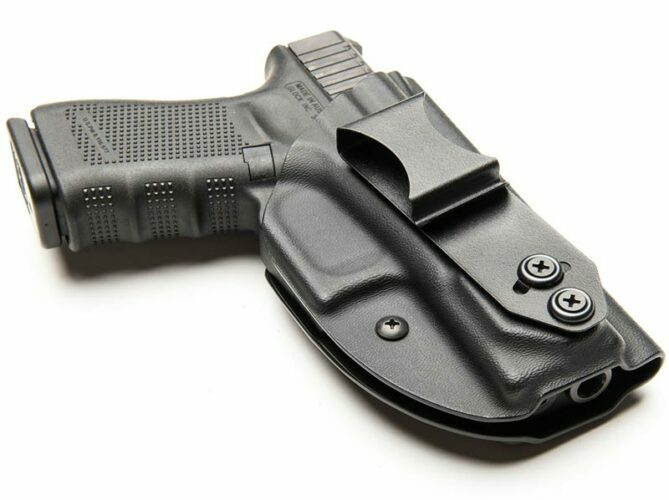 Will the new 3.6″ fit in holsters for the first-gen M&Pc ? Thanks! Great question! It depends upon the holster. My L.A.G. Tactical, The Defender Kydex IWB holster for my 1st gen M&P 9c does not fit correctly with the Compact 3.6″ in it. However, my Galco TR 474 Kydex IWB holster (which I don’t like as much and thus don’t use very often) fits great. Since I really like my L.A.G. holster, I ordered a new L.A.G. 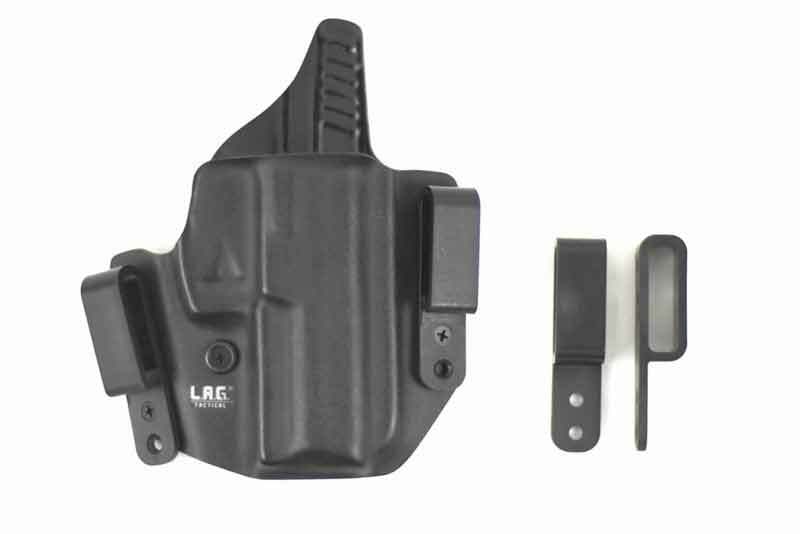 Tactical Defender holster for 3.6″.